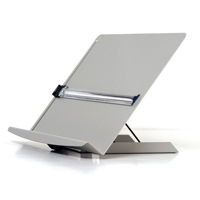 Twisting the neck in order to read documents that are lying on the desk can be avoided by using a document holder. Placing the holder either in-line with the monitor or right beside the monitor can greatly reduce neck stress. 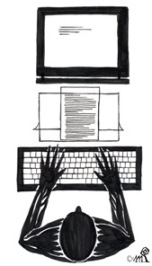 Placing the document holder so that it is in between the keyboard and monitor, such that they are “in a line”, is the optimum arrangement of a document holder. This position completely eliminates neck twisting (turning the head back and forth between the monitor and the document). Instead you just have a small amount of up and down movement. 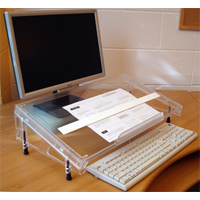 However some desks have space limitations that prohibit the use of such document holders. 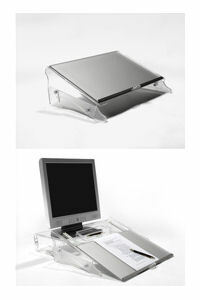 In those cases a free-standing document holder can be used. 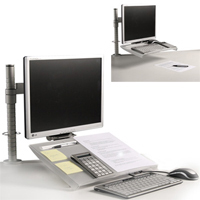 The recommended position of a free-standing document holder is right beside the monitor, reducing the amount of neck twisting as you look between monitor and document. Note: Check the Book Holder page for other possible solutions. Twisting the neck to read documents can contribute to neck pain. 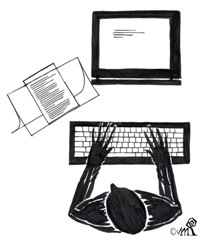 Placing documents in line with the keyboard and monitor can reduce neck stress. Click here for the Under Monitor Document Holders. 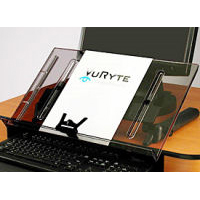 Click here for the Vision Vu Free Standing Document Holders. 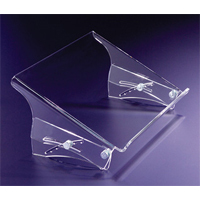 Click here for the Microdesk Document Holders. 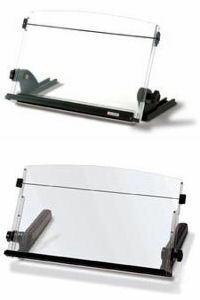 Click here for the 3M Freestanding Document Holder. Click here for the Bakker Elkhuizen FlexDesk. Click here for the Bakker-Elkhuizen Q-Doc Document Holder. Click here for the Humanscale Copy Stand Basic. 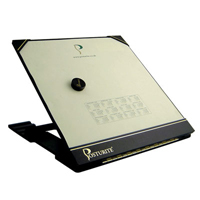 Click here for the Posturite MultiRite. Click here for the Posturite Board. 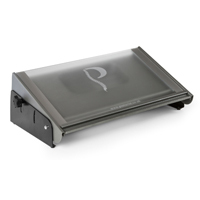 Click here for the Bakker Elkhuizen Clean-Doc Document Holder.